With its clusters of fleshy, gem-like seeds inside, the pomegranate is not an easy fruit to process and enjoy. You cannot easily remove the edible flesh from the seeds, so the best way to enjoy the taste and benefits of pomegranate is by using a really good juicer. Freshly squeezed pomegranate juice is both refreshing and incredibly healthy. You can always try blitzing the seeds in an ordinary juicer, but then you will have to strain the juice to remove the seeds. And the ground seeds can alter the taste somewhat. Another option is to put the fleshy seeds in a strainer and manually press with your fingers to extract the juice. But that can be labor intensive and time-consuming. 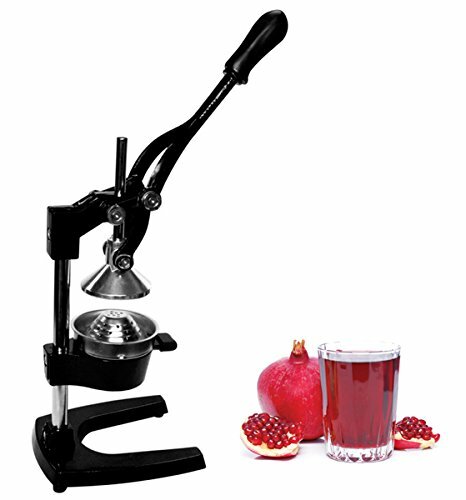 The best option if you want to drink crimson red pomegranate on a regular basis is to buy a dedicated pomegranate juicer/press. 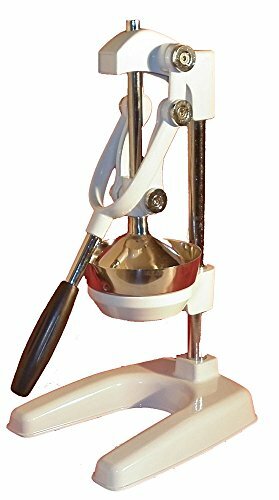 This is a hand operated juice press that is designed to work with citrus fruits and pomegranate. The best juicers will efficiently squeeze out the juice without crushing the seeds. Headquartered in Solingen, Germany, Cilio is a brand well known for high-quality workmanship. Nicknamed “The Press” this juicer from Germany is designed to handle anything from pomegranates to citrus fruits like orange, grapefruit, and limes. As far as the looks are concerned, “The Press” cannot be faulted for poor fit and finish. Everything seems well put together. The base is solid, with rubber feet that plant in on the surface in a stable manner. While the base is made out of painted aluminum, the pole and the work surfaces of the funnel and extractor that come in contact with the fruit are made from stainless steel. 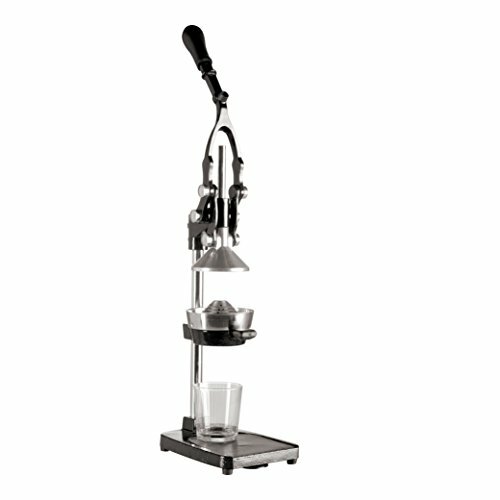 Juice extraction is not hard, thanks to a long handle with an excellent grip. You don’t have to exert too much pressure to extract the juice. On the whole, this is a very good device, albeit a tad too pricey. 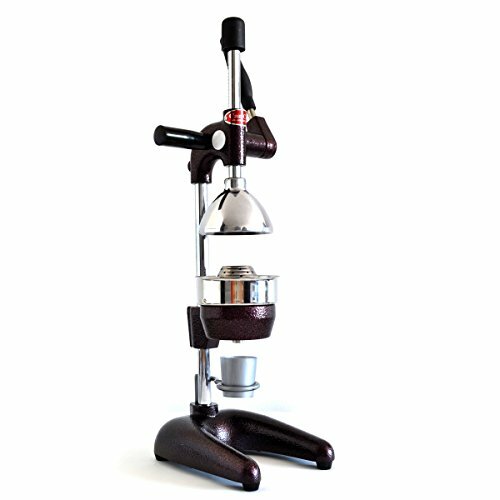 Though marketed as a commercial grade juicer, the CO-Z is perfectly at home in a domestic kitchen as well. In fact, it looks more at home there than in a restaurant or juice bar. The device has an all metal construction, with a cast-iron base, and stainless steel on the working parts. Though they call it a citrus juice, the CO-Z works equally well with pomegranates. The device looks well built overall. The handle is also very comfortable to grip, and squeezing out juices do not take a lot of effort. This device also has rubber feet at the base for extra support and stability. But we did encounter a problem where the back side of the base tilts up somewhat when you press the handle all the way down. Other than that, this press worked reasonably well. 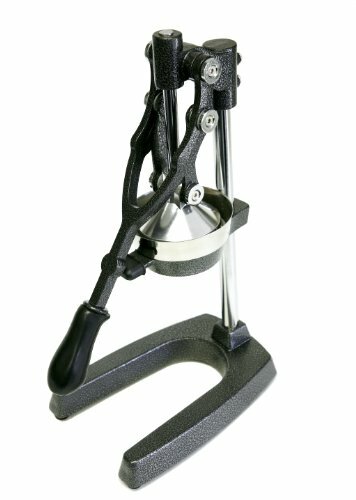 The Titan is a compact metal juice press with a white painted body and base. The material used is a durable zinc alloy. The work surfaces and shaft are stainless steel, with the additional protection of a white powder coating. This makes these surfaces easier to clean. The broad base has suction cups at the bottom for extra grip. 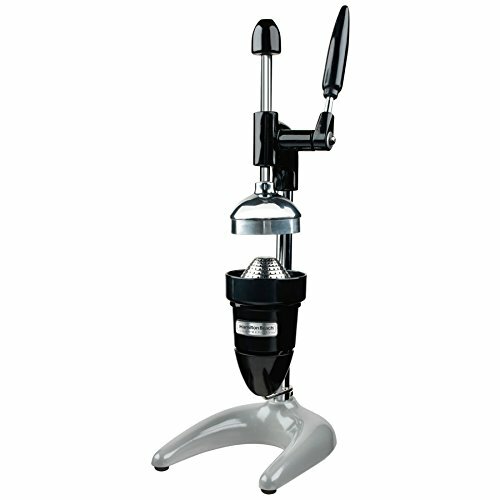 The handle grip is rubberized, providing extra comfort while using the machine. Juice extraction is easy and efficient, but only with smaller pomegranates. We did notice a fair bit of wastage when larger fruit was pressed. The size of the cup is the main issue here, forcing us to reduce the size of the portions we fed to the press. There were also minor stability matters relating to the handle, which forced the machine to tip forward sometimes. This press is made from a combination of cast iron and stainless steel parts. It doesn’t look too impressive, with a grainy textured surface. The surface is enameled, so it is at least more durable. The grip on the handle is rubberized for extra comfort. Though the press looks sturdy, there were some notable QC issues. The device is not very efficient at getting out all the juice, especially when used with larger portions of fruit. The strainer also has a propensity to get blocked. Overall this juice press didn’t work up to our expectations for pomegranate. Decked out almost entirely in black, this juice press has only a few visible metallic surfaces, despite being an all-metal device. The body is made out of cast iron, while the parts that come in contact with the fruit are made of stainless steel. Though advertised as a juicer for pomegranates, we found this device to be rather inadequate for that particular fruit. The press is way too small to handle even medium sized pomegranate. A lot of the fruit pulp is left wasted when the press is used. There are also balance issues that are common with many pomegranate presses being sold online. Overall, this device disappointed in its performance with pomegranates. But if you plan to use it only for citrus, it should work okay. 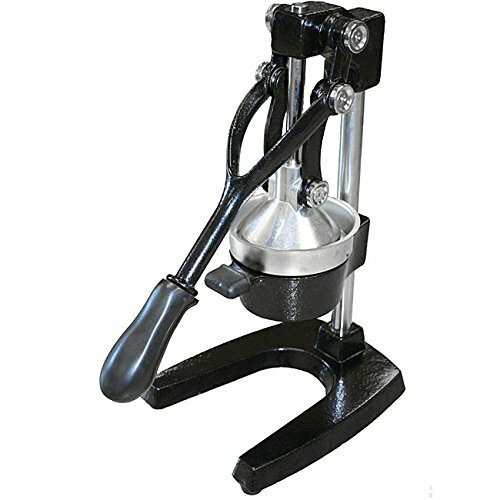 Cast iron and stainless steel seem to be a popular option in the market of affordable pomegranate juice presses, and this one is no exception. The device is available painted black or gray, with the enamel finish improving its durability and rust resistance. The ergonomic handle has a rubber grip for easy usage. One main advantage of this machine is its compatibility with larger containers at the base. Most other presses only work with smaller glasses. The funnel and strainer can be removed for easy cleaning. While the juicer does an okay job, its base is too small to keep it steady without tipping over at times. Also, the juice extraction from pomegranates is underwhelming when compared to some other brand presses. Can Can is a Turkish product, and a very robustly built one at that. Pomegranate presses like this one are very popular out there in the Middle East, and this one is a sturdy, genuinely commercial grade product. It is very heavy and has a solid base that does not budge even when you put a lot of pressure on the handle. The balance is spot on, and the base has rubber feet to protect your counter top from scratches. The very short rubberized handle is easy to press and prevents the juicer from tipping over. The Can Can is a well-made device, with all metal body and a pleasant coffee brown enamel on the base and some other parts. It is rather expensive but might be well worth it due to the extra performance and quality on offer. 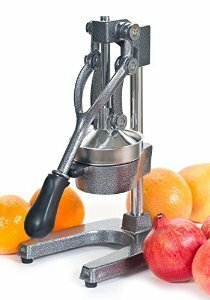 Though they do not explicitly mention that this juicer will work with pomegranates, in our experience, it was one of the better performers in our reviews. The entire device oozes with quality, and it is one of the best looking machines in our shortlist. Designed for commercial use, this juicer has a slew of advanced features. The entire metal body, including the enamel coated base, is acid resistant and extremely durable. It uses a short handle for improved balance and efficiency. Juice collection mechanism is advanced as well, with drip cup on a swing out arm ensuring that not even a drop of the liquid is wasted. This is an excellent juicer, albeit at a rather high price point. This is a rather cheap looking juicer with a metal body and an enamel-finish on the base. That base does look somewhat small and inadequate on the first inspection. The device is made of cast iron and steel. The base was quite unstable when the juicer was used, and on the whole, this device was quite inefficient in extracting juice. The fit and finish were also quite lacking, with screws becoming rather loose in a short period. This an affordable home juicer which is commercial just in name. This is a largish, solid cast steel juicer with a baked enamel finish at the base. The parts that come in contact with fruit are all polished stainless steel. The base has noticeably long feet, with rubber pads underneath for skid proof performance. 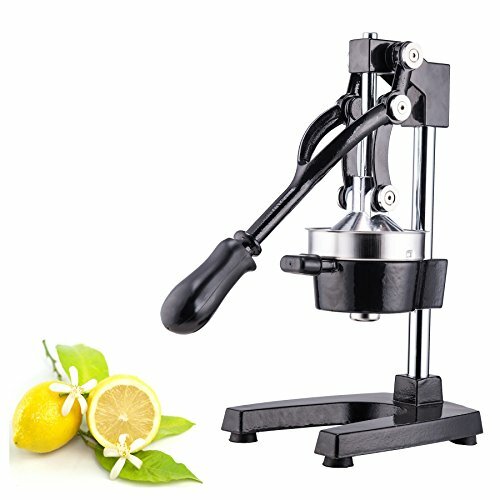 The juicer is sold with a complimentary lemon squeezer free along with the package. Marketed mainly as a pomegranate juicer, this press does an okay job. There are some wastage and splatter involved, but only if you use larger pieces of pomegranate. Being messy is a minus point though since pomegranate stains are tough to remove. This is a pity, as the juicer is not bad otherwise, especially with citrus.